Low cost 300 watt portable power inverter for car, convert 12v DC to 110v, 120v, 220v, 240v etc. 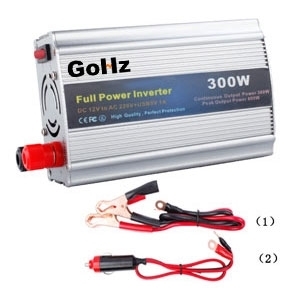 Tips: What need to pay attention in using a portable power inverter on car? First, must follow the user manual strictly in using a car power inverter; Second, the output voltage of the car power inverter is AC power (110v, 120v, 220v, 230v, 240v etc. ), and in movable state, it should be placed in a secure location (especially keep away from children), to prevent electric shock, and cut off the DC power source when it's not in use. Third, do not place the car power inverter under direct sunlight or near the heater outlet. The car power inverter operating ambient temperature should not exceed 40 degree C. Fourth, the portable power inverter operation will generate heat, do not place items on or near it. Fifth, do not make raining or sprinkling water to the car power inverter.